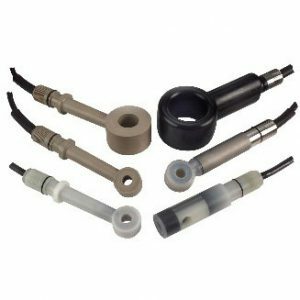 The 871FT Toroidal Flow-Through Sensors are a family of in-line, non-invasive Sanitary or Industrial sensors that measure the conductivity of virtually any conductive liquid. They are offered in many common line sizes from 0.5 to 4.0 inches. A selection of construction materials to accommodate a wide range of sanitary and industrial applications is also offered. Vaaler Award from Chemical Processing Magazine for industrial version; top honors from Food Processing for sanitary version. Compatible with Foxboro Intelligent and Analog Transmitters and Analyzers. Non-invasive modular design permits ease of installation, and removal from process line without need to open line. Unique patented sensor and toroid design. Sanitary sensor complies with 3A Sanitary Standard 74-02; and FDA compliant bore materials. It has a crevice-free design, interior bore surface <16 microinch finish, clean-in-place (CIP) operation, and quick-disconnect construction. Industrial sensor with a wide selection of materials. Designed to significantly reduce coatings or foulings, to eliminate sidewall effects, and also to eliminate exposure of personnel to hazardous chemicals. No obstruction of process flow. In-line calibration negates safety issues. Pressure Equipment Directive (PED) compliance per PED 97/23/EC for most versions. Numerous options and accessories offered.